HIGH The new tutorial is a thing of beauty. As is the game itself. LOW No English dub after the excellence of the last one? WTF Baiken’s in there and not playable? Sacrilege! Let’s get something out of the way right here at the start—Guilty Gear Xrd: Revelator is awesome. As the latest installment in the Guilty Gear franchise it’s a superb experience in nearly every aspect, and its quality is so high that it constantly surprises me that the series has only ever achieved niche levels of success in the West. One possible reason? It’s a series which expects a certain level of dedication from its player base, and therefore has the potential to cause casual fighting fans to run away screaming in terror long before they ‘get’ why it’s so darn enjoyable—hence Revelator‘s new, in-depth and deceptively friendly approach to introducing its brand of hyperkinetic combat. First, there’s a great new tutorial which eases newcomers into Guilty Gear by having them play minigames which introduce concepts such as movement, gattling combos, air dashing and the like in amusing and unique ways. From bursting balloons to deftly countering the attacks of rampaging cartoon ghosts, it’s a great method of familiarizing new players with this exceptionally complex fighting system. This tutorial goes above and beyond, including combo trials and character-specific advice on how to overcome situations that players may find themselves in. It’s great stuff, but be warned—the skill ceiling is still extremely high in Guilty Gear compared to other fighters. Perhaps this, then, is why they’ve also added a control option which handles much of the heavy lifting. Simply slapping buttons will launch into some excellent combos, often including super attacks and aerial launchers. There’s a slight damage penalty for using this option, but it might help beginners get an idea of what they should be doing combo-wise. 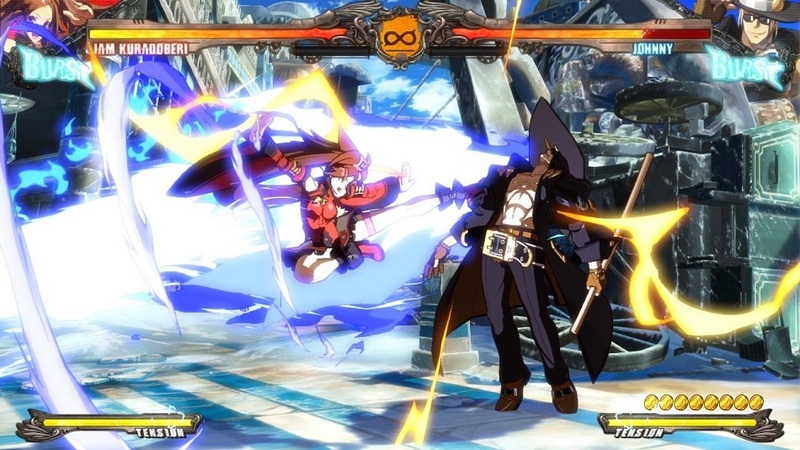 As an update and semi-sequel to Guilty Gear Xrd: Sign, the backstory reflects the events of the previous game and there have been a bunch of new faces added to the roster. Old series favorites like katana-wielding sky pirate Johnny and Chinese martial artist Jam Kuradoberi return to smash faces once again, and they’re joined by cool additions such as Jack’O and Raven. Jack’O in particular is brilliant, amusingly designed to drop various monster closets around the arena which will both cause trouble for the opponent and level up over time if they aren’t destroyed quickly. Also, I almost choked the first time I saw her Instant Kill in action—she inadvertently obliterates an entire continent after dropkicking her unfortunate victim from outer space. The story mode lets players watch events play out as a beautifully-animated visual novel with no personal input, and there are even a few action scenes that are more impressive than I remember in the previous installment. There’s one major annoyance this time out, though—given that it concludes halfway through the plot and several important characters get almost no screentime, it comes off as blatant sequel mongering. It makes no effort at all to wrap any of the story threads, and it ends on a massive cliffhanger just as events should be catching fire. Still, everything involving Ramlethal is top notch, there’s a hilarious cameo from a certain down-and-out character I couldn’t possibly spoil, and—perhaps most excitingly of all—Baiken’s in there with a model so lavishly detailed she’s almost certainly going to be joining the roster before long. Finally! The online is worthy of special mention, as it’s arguably the most important factor when it comes to a fighting game’s longevity. Fortunately, Guilty Gear Xrd: Revelator nails this aspect admirably. The netcode is solid, with even games held between Japan and the UK offering decent matches. More than this, there’s a whole bunch of little things that make the online a delight. The lobbies have been made into arenas where player avatars can run around chucking dice, slinging out emotes, hopping onto vacant arcade cabinets to play other players and… fish stuff out of a nearby fountain. It also offers a basic gacha style gambling system using in-game currency to unlock new emotes, character and profile customization options, new soundtracks and more. It’s cheap, cheerful, and does a better job of gambling for item rewards than any game I can recall in recent memory—especially ones which demand real money microtransactions and offer nothing of worth in return. There are some slight blemishes on the package, though. There’s no longer an English dub (curious given how accomplished the previous one was), some of the translation work is spotty in regards to typos and spacing errors, and Jam doesn’t have a storyline in Episode mode despite being playable there. It’s not like the game feels unfinished with these particular omissions, mind, it’s just that when there’s so much generosity on display, even relatively minor things such as these stand out. Disclosures: This game is developed by Arc System Works and published by Aksys Games. It is currently available on Playstation 4. This copy of the game was obtained via publisher and reviewed on the PS4. Approximately 15 hours of play were devoted to the single-player mode, and the game was completed with most of the available characters. 5 hours of play were spent in multiplayer modes. Parents: According to the ESRB, this game was not rated at the time this review was written. The previous game earned a T rating though, and contained blood, language, suggestive themes, use of tobacco and violence. This one also has some alcohol being consumed in it, but there’s really nothing about it that I’d consider harmful to its intended audience. Deaf & Hard of Hearing: The game’s dialogue is spoken in Japanese and subtitled, with most of the gameplay remaining entirely playable through visuals alone. Certain audio cues may be missed, but are not overly important to the game’s flow. Remappable Controls: Yes, this game offers fully remappable controls. Colorblind Modes: There are no colorblind modes available in the options. Furthermore, while I’m not colorblind myself and can’t tell for sure, the menu system looks like it might cause some trouble for some people. Menus are orange, with a slightly lighter shade of orange used to signify the current selection. Spawned in the wilds of Scotland like some random MMORPG enemy whose sole purpose is to be hunted down and slaughtered for loot, young Darren spent the first fifty years of life eating bark and bears alike in a desperate bid to survive the elements. The chance discovery of a muddy, burnt out copy of '50 Shades of Grey' in a hunting pit gave him an appreciation for complex plots, characters and overarching narrative, and the unexpected gift of a Spectrum 48k allowed him to indulge in these newfound sensibilities with intelligent, highbrow games such as 'flee from the badly animated spinning turquoise dolphins' or 'avoid the deadly glowing bricks of doom'. The fusion of both these interests finally culminated with Darren teaching himself how to write by basically guessing at what words might look like when jotted down on paper as opposed to being howled inarticulately at the skies. Now others occasionally get to read his scribblings. Lucky them. Patricia Milfred on Lone Wolf on Switch – Win a physical copy! Jason Venter on Lone Wolf on Switch – Win a physical copy! Dia Lacina on Lone Wolf on Switch – Win a physical copy! Andrew Brown on Lone Wolf on Switch – Win a physical copy! Jessica A Entwistle on Lone Wolf on Switch – Win a physical copy! Robert Clark on Lone Wolf on Switch – Win a physical copy! Obed Marob on Lone Wolf on Switch – Win a physical copy! 1) Treat all users with respect. 2) Post with an open-mind. 3) Do not insult and/or harass users. 4) Do not incite flame wars. 5) Do not troll and/or feed the trolls. 6) No excessive whining and/or complaining.